'Sofala' is regarded as one of Russell Drysdale's finest paintings, representing the artist at the height of his powers. 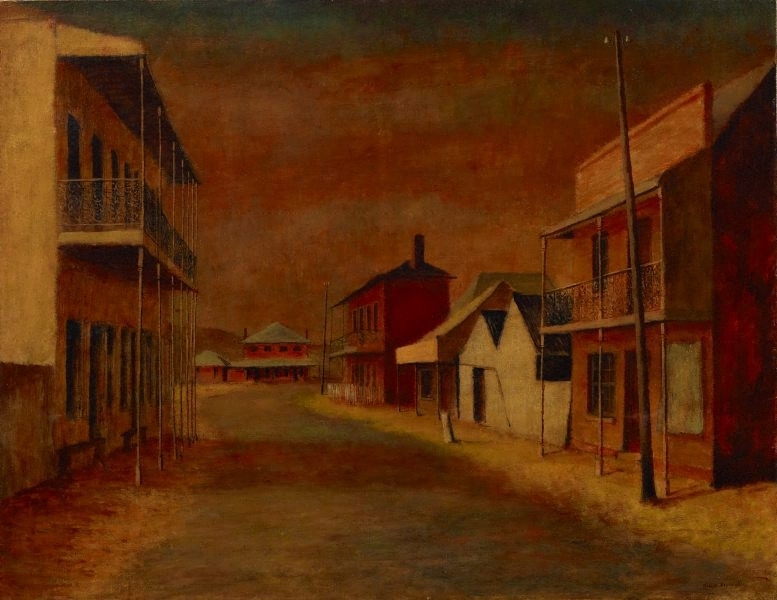 With its compelling evocation of atmosphere and ambience, the painting transcends literal description of a particular place to become an expression of the quintessential qualities of an inland Australian country town. Drysdale first visited this former gold-mining settlement in August 1947 with fellow artist Donald Friend. He made a sketch and took photographs but, as was customary for him, completed the painting in his studio on returning to Sydney. In 'Sofala', Drysdale pares down the reality of the subject to its barest essentials, achieving an intensified synthesis of visual and emotional impact. His modernist focus on the construction of mood in this work marked a radical departure from the prevailing traditions of Australian landscape painting. This painting won the Wynne Prize in 1947 and was acquired by the Gallery in 1952. Signed l.r. corner, brown oil "Russell Drysdale". Not dated.